Cylindroma is a benign adnexal tumor of the skin with eccrine and apocrine differentiation. It commonly occurs in the scalp, face and extremities. It is also known as turban tumor because of its typical turban like growth in the scalp. Fine-needle aspiration cytology (FNAC) diagnosis of cylindorma has rarely been described in the literature. Herein, we report a rare case of fine needle aspiration findings of a dermal cylindroma diagnosed on FNAC and subsequently confirmed on histopathological examination. A 40-year-old housewife presented to us for evaluation of a right sided mid-cervical swelling. The swelling was painless and was gradually increasing in size for last 8 months. She had no other swelling in other parts of the body and had no constitutional symptoms. Examination revealed a well-defined 2 cm × 2 cm, nontender, firm, nodular swelling of the neck. The overlying skin was fixed to the swelling, but there was no erythema, induration, ulceration or puckering of the overlying skin. The swelling was not fixed to the deeper structures. Aspirate obtained from the swelling was blood mixed and particulate. The smears were cellular and showed multiple clusters and discrete small, round to oval cells with hyperchromatic nuclei, inconspicuous nucleoli and scanty cytoplasm. In addition, the background showed deposits of basement membrane type material. This was dark magenta colored pinkish globular material. The globules were occasionally surrounded by basal type of cells. Occasional cells with elongated nuclei were also noted. A diagnosis of benign adnexal tumor, likely cylindroma, was offered [[Figure 1]a and b]. The patient underwent excision biopsy. Gross examination showed a well-circumscribed 2 cm diameter grey-white skin covered swelling. Histopathological examination of the swelling revealed a well-circumscribed, highly cellular tumor. The tumor cells were arranged in the form of sheets and clusters in a jigsaw puzzle-like fashion. Deposition of abundant basement membrane-like material was noted in between the tumor cells. The tumor cells were small, round to oval with hyperchromatic nuclei, inconspicuous nucleoli and scant cytoplasm. No nuclear atypia, increased mitotic activity, necrosis or invasion into the surrounding structures was noted [[Figure 1]c]. Based on these features, a diagnosis of cylindroma was made. Dermal cylindromas are most commonly seen in middle-aged and elderly females with preponderance in the head and neck region, especially over the scalp. Most cases are sporadic and present with solitary lesions. However, when associated with familial inheritance, they tend to be multiple. Clinically, cylindorma presents as single or multiple, dome-shaped, smooth, nodular lesions over scalp, face and in rare instances, over trunk and extremities. Numerous nodular swellings over the scalp may give rise to the characteristic appearance of a "turban tumor." In this present case the round pinkish acellular material surrounded by round monomorphic cells and discrete monomorphic round cells suggest features of cylindroma. The present case may be mistaken as adenoid cystic carcinoma of salivary gland. Cytologically it is difficult to distinguish cylindroma from adenoid cystic carcinoma of the salivary gland. , Bondeson et al. in their study warned on this aspect and suggested restricted excision before any wide excision surgery. However, we feel that the absence of salivary tumors and swelling fixed in the subcutaneous tissue may indicate the dermal origin of the tumor. We report here a rare case of cylindroma in neck region. The characteristic cytological features on FNAC along with the subcutaneous location of the tumor and absence of primary salivary gland tumor may help to diagnose such rare case. Hashimoto K, Lever FW. Tumours of the skin and appendages. In: Fitzpatrick TB, Arndt KA, Clark WH, Eisen AS., Van Scott EJ, Vaughan JH, et al., editors. Dermatology in General Medicine. New York: McGraw Hill; 1971. p. 452. Bondeson L, Lindholm K, Thorstenson S. Benign dermal eccrine cylindroma. A pitfall in the cytologic diagnosis of adenoid cystic carcinoma. Acta Cytol 1983;27:326-8. Singh DD, Naujoks C, Depprich R, Schulte KW, Jankowiak F, Kübler NR, et al. Cylindroma of head and neck: Review of the literature and report of two rare cases. J Craniomaxillofac Surg 2013;41:516-21. Wang N, Leeming R, Abdul-Karim FW. 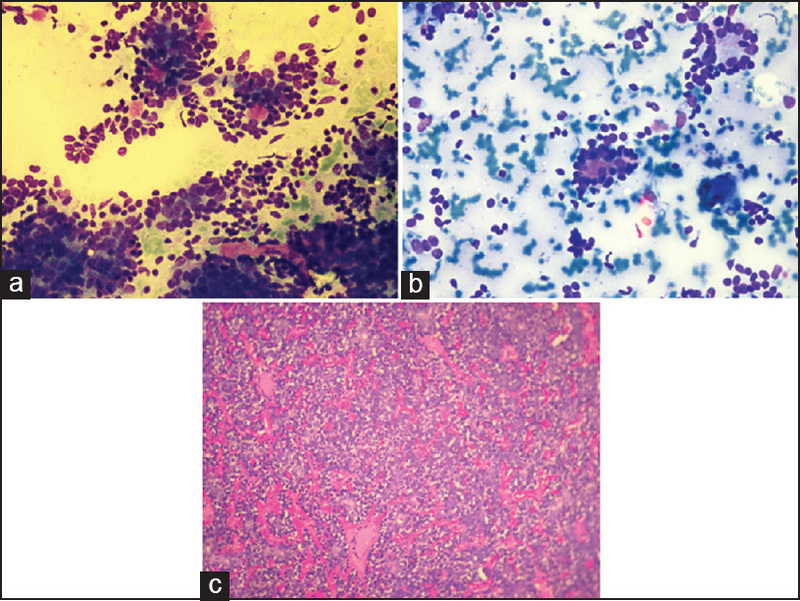 Fine needle aspiration cytology of breast cylindroma in a woman with familial cylindromatosis: A case report. Acta Cytol 2004;48:853-8.